When many blocks of text need to be formatted identically, it can be tedious to select and format each block. 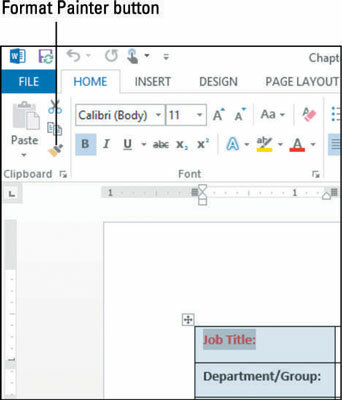 As a shortcut, Word 2013 offers the Format Painter feature. Format Painter picks up the formatting from one block of text and applies it to another. If you select the destination text, Format Painter copies only character-based formatting (that is, the type of formatting created by the commands in the Font group of the Home tab). If you click in a paragraph as the destination, rather than selecting specific text, Word copies both character and paragraph settings. Paragraph settings include things like left and right indents, tab stops, and spacing between lines. Open your Word 2013 document that has a table to format. In this example, the table is of a job posting. Click and drag the mouse pointer across the text title text, Job Title in this example, to select it, and then choose Home→Format Painter. Click and drag across the text you want to format, Department/Group in this example, to paint the formatting onto that text. The Format Painter feature turns itself off automatically. With the text you just formatted still selected, double-click the Format Painter button. Double-clicking Format Painter rather than just clicking it once turns it on so that it remains on until you turn it off. Drag across each of the other headings you want to have the same formatting, one after the other. The formatting is copied to each of those blocks of text. When you’re finished, the formatting your table will be similar to the example. Click the Format Painter button to turn off the feature, and then save your work.